Tram on the promenade at the fishing port of Fleetwood,Lancashire,England. 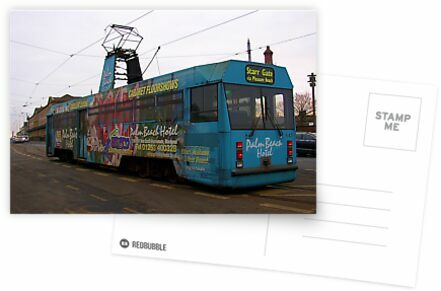 The tramway runs between Fleetwood and the holiday resort of Blackpool,is 110 years old and carries 6,500,000 passengers a year. A complete contrast to the other one, which was like in its original colours. yes a more modern one ,this one. thanks for the comments Richard. Great shot Paul. Do they run all year? Glad to bring them back Karen. Thanks Bev,yes they are the old and new,there are some great 1930s about too. Great capture Paul..rode a few of them in Melbourne last week, though none as bright and colourful as this one…great detail and clarity. Thanks. I`m sure people will come to like the new trams in time.we had the same controversy when re introduced to Manchester,but most think they area good idea now.